A two day non residential retreat to unplug, disconnect from the outside world, and reconnect with YOURSELF. Raw Food chef Manuela Scalini and International Yoga Teacher Judith Daniel have created the Detox & Rejuvenate Weekend Getaway. A weekend totally dedicated to YOU and your wellbeing! 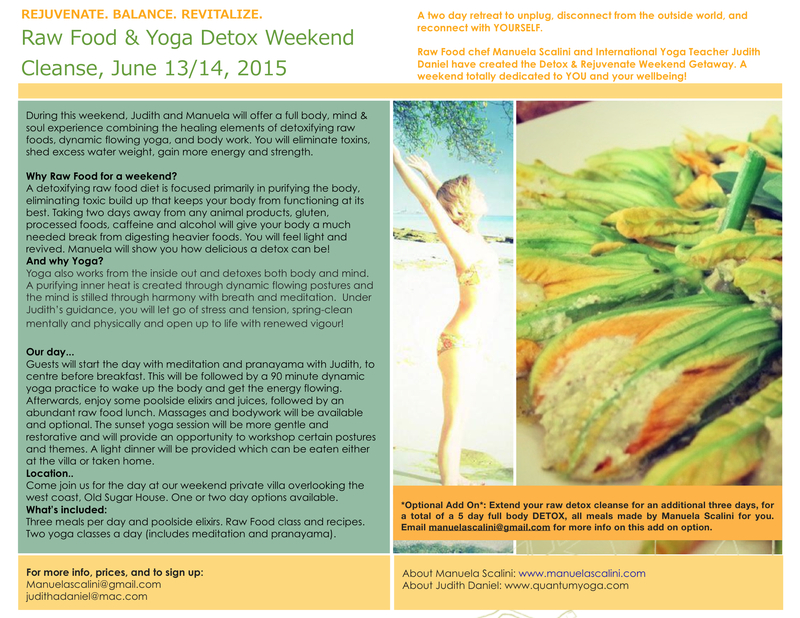 During this weekend, Judith and Manuela will offer a full body, mind & soul experience combining the healing elements of detoxifying raw foods, dynamic flowing yoga, and body work. You will eliminate toxins, shed excess water weight, gain more energy and strength. Why Raw Food for a weekend? A detoxifying raw food diet is focused primarily in purifying the body, eliminating toxic build up that keeps your body from functioning at its best. Taking two days away from any animal products, gluten, processed foods, caffeine and alcohol will give your body a much needed break from digesting heavier foods. You will feel light and revived. Manuela will show you how delicious a detox can be! Yoga also works from the inside out and detoxes both body and mind. A purifying inner heat is created through dynamic flowing postures and the mind is stilled through harmony with breath and meditation. Under Judith’s guidance, you will let go of stress and tension, spring-clean mentally and physically and open up to life with renewed vigour! Manuela Scalini, born and raised in Brazil, is an international raw food chef and travels the world teaching raw food workshops, catering retreats and consulting for raw food restaurants in SE Asia, USA and Latin America. When she is not traveling, she is offering classes and day retreats out of her island home in Barbados. It is in Barbados that she hosts her signature retreats of Raw Food & Surf Detox. A Certified Raw Food Chef from Living Light Culinary Arts Institute, and Certified Yoga Instructor, Manuela intwines her Brazilian heritage into her culinary delights, creating an unique exotic experience. As a world traveler, Manuela is an expert in tropical flavors and cuisine. One of her many passions is creating beautiful gourmet living food dishes using local and seasonal flavors of all the places she travels to. Drawing inspiration in the freshest ingredients to nourish and energize the body, mind and soul. Judith Daniel (www.quantumyoga.com): Yoga has been a constant in Judith’s life for over 20 years and has helped to keep her calm and centred throughout her career in the hectic music Industry. Working in the highly stressful areas of PR and Events, she often said that she would love to give it all up and become a Yoga Teacher. And finally, she did. Now she’s thrilled to be sharing everything that it has taught her and inspiring others to take to the mat. She teaches creative, flowing sequences which synchronise breath and movement. An international Yogi and sun-seeker, she fell in love with Barbados 20 years ago and is a regular visitor to the island. Guests will start the day with meditation and pranayama with Judith, to centre before breakfast. This will be followed by a 90 minute dynamic yoga practice to wake up the body and get the energy flowing. Afterwards, enjoy some poolside elixirs and juices, followed by an abundant raw food lunch. Massages and bodywork will be available and optional. The sunset yoga session will be more gentle and restorative and will provide an opportunity to workshop certain postures and themes. A light dinner will be provided which can be eaten either at the villa or taken home. Come join us for the day at our weekend private villa overlooking the west coast, Old Sugar House. One or two day options available. Three meals per day and poolside elixirs. Raw Food class and recipes. Two yoga classes a day (includes meditation and pranayama). BDS $520 per person for retreat for two days, 2 yoga classes each day (4 yoga classes total), ALL raw food meals for both days, and a raw food workshop. BDS $260 per person for detox for one day only. Three meals, 2 yoga classes, 1 raw food workshop. You can then pay here via pay pal, or arrange to pay cash to either Manuela or Judith. We require a BDS $100 deposit to reserve your spot (unrefundable if cancelled after June 6) and the remaining payment is due 7 days before the retreat (by June 6).